If you hadn’t heard about Rhodes Scholarships while you were a college student at the UW, you certainly heard about them during the 1992 presidential campaign. 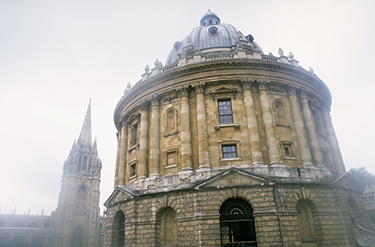 Candidate Bill Clinton boasted that he had been a Rhodes Scholar, the world’s oldest and most prestigious international scholarship for undergraduates, which covers two to three years of study at Oxford University. Clinton’s time at Oxford came under intense scrutiny — it’s where the future president admitted he had tried marijuana but “didn’t inhale.” Several of his friends from Oxford advised him during his campaign and two later served in his administration — Strobe Talbot and Robert Reich. Many say that Clinton’s best friend at Oxford was Frank Aller, ’68, who became a draft resister during the Vietnam War and later committed suicide. The list of UW alumni who have won Rhodes Scholarships is also daunting. One runs a billion-dollar media giant, another is a top attorney at Microsoft, yet another works for the British government in international development. Several are brilliant educators and there is also a journalist and a poet. With luck and perseverance, I was able to interview 11 of the living UW scholars. I’ve interviewed Nobel Prize-winners, university presidents, film directors, authors, senators and software billionaires-but these were some of the most challenging and intellectually stimulating interviews of my career. We could start with an innocent question about studying at Oxford and end up discussing the fall of the Soviet Union. They sent me stunning poetry or shared humorous anecdotes about being the target of a scathing editorial in The Times of London. All of our alumni have told me that the scholarship changed their lives, but they all added another comment. The University of Washington changed their lives too, and for many, it had a greater impact than their years in Oxford. Those comments really don’t come as a surprise to me. Their stories confirm what this University does best — transforming the world one student at a time.